A logic analyzer is a spezial tool for trouble shooting in computers. On measurements in computers it is not so important to measure voltages exactly, but to measure as much concurrent events as possible to see the timing relationship between them. Because electronic computers all work binary today, it is sufficient, if a logic analyzer can register if a logic level is 0 or 1. The number of input chanels can't be too big. The ATLAS 9660 is very flexible by the two plug in slots below the screen and the floppy disks. There was an extender box which could hold another twelve plugins. There were plugins with particular many (96) chanels or particular fast ones (300MHz). Consider, in 1984 typical processor clock rates were 8-16 Mc! 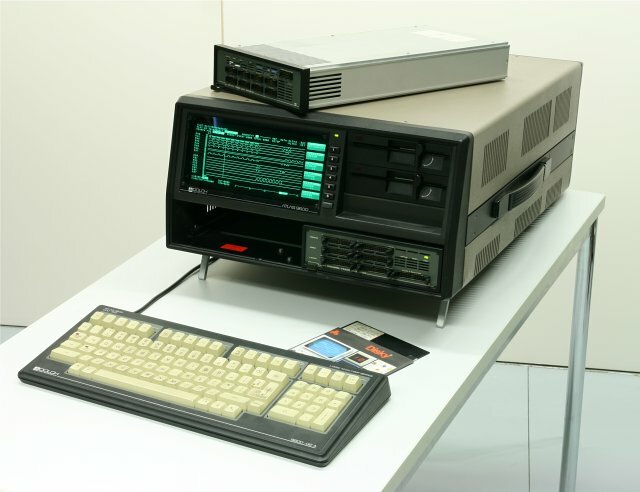 The Atlas 9600 is controlled by four Z80 processors running the operating system MP/M, a multiuser/multitasking variantof the then widespread CP/M. On the next picture the LA can be seen running. Because a repair the cover is removed, in front of the keyboard are the pods, which are connected to the logic board in repair.